I like plants. 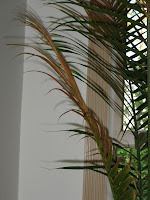 Artificial plants are fine, I think they can make a room nice and cozy and homey, but I really like real plants. I nurtured some houseplants in my dorm room throughout college just fine. 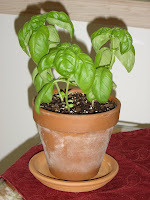 In my apartments, I've grown basil on my kitchen windowsill almost year round. My Lucky Bamboo is alive and well and thriving. I had a prayer plant that did amazing (I gave it away when I moved out west). I'm certainly no expert, maybe I got lucky, maybe all of the aforementioned are indestructible, but I really had no qualms, no fears, no worries about getting some real plants for the sunroom. In April, we bought and potted greenery for the sunroom. It made the sunroom so much cozier. The sunroom became a relaxing retreat from reality. 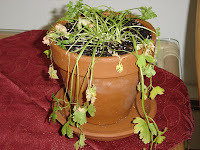 Time for an update on the plants, and it's not a good report card for SP & Blueeley. 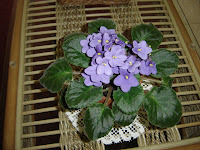 The African Violet? It's doing well, just a couple of petals looking a bit brown. 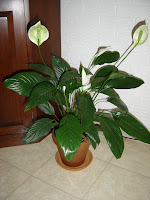 Peace lily? This one looks good, lots of new white flowers, but a few yellowish leaves at the base of the plant. Plant with burgundy tinged leaves? I guess it's doing fine despite a few brownish looking leaves. Plant with multi-colored leaves? 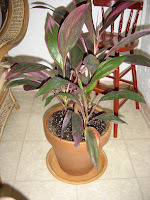 Same as the burgundy tinged plant. The basil? Surviving despite not getting a lot of direct sunlight, which is what basil really wants. The Majesty Palm. One day, I was in the sunroom and it looked green and healthy and happy. 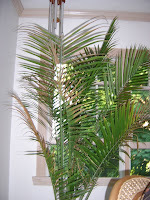 Two days later, several palms were brown. Crispy, snap off, brown - dead. We suspect that we did not water it enough, despite the tag that said it didn't require much watering. 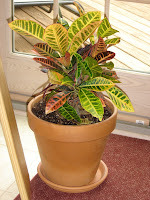 Then I read online that even though stores like Lowe's and Home Depot sell these in the northeast, they really are not well-suited for the northeast, even in sunrooms. We've implemented a 'Save Plan.' First, we bought the palm it's own personal bottle of liquid plant food. Second, we bought a spray bottle and we mist the palm daily. Third, we try to move it from the sunroom out onto the deck for more direct sun and heat on days when no rain is forecast. We aren't sure if all this effort is paying off yet - it seems happier, but yet there's still brown palms. 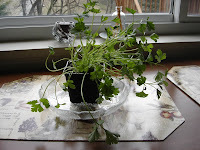 SP's brother entrusted us with the care of the CSA parsley. I am afraid to let him see what it looks like today.